Dice the chicken into about half inch squares. The smaller the better- it’s going to get rolled up too! Place the chicken in a pan with the 2 tbs. butter and onion. Season the chicken with Seasoned Salt. Remove the chicken when it is ALMOST done cooking. Don’t worry- it will finish cooking in the oven later. We don’t want dry chicken, do we? Remove the chicken from the heat and allow to cool down. Meanwhile, put your red sauce together and simmer over low heat. To put together the white sauce, melt the butter in a pan over medium heat. Whisk in the flour slowly until it’s all combined. Next, whisk in the milk. Add the salt and pepper. Simmer over low heat. (The longer you let this sauce sit, the thicker it will get. If it becomes too thick just whisk in some more milk). Now, scoop the ricotta cheese into a large bowl. Salt and pepper to taste, and parsley. Combine well. Add the chicken (I also add the juices, but it’s not needed). Now to roll the lasagna. Spoon the ricotta mixture right down the center of the lasagna- make this a thin line. When you roll it, it will fill out. Place the lasagna rolls in a baking dish, that’s lined with the white sauce. Then, drizzle the white sauce down the middle of the roll. Now, drizzle the red sauce over the rolls. I also like to add the sauce around the perimeter of the dish. 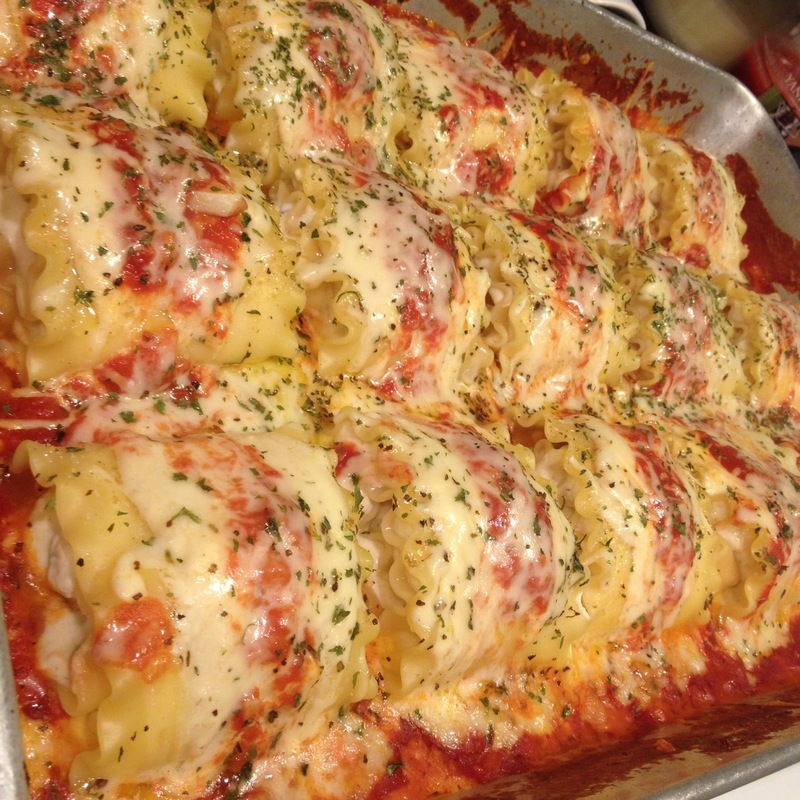 Now, sprinkle each roll with the parmesan cheese and mozzarella cheese. Sprinkle basil and parsley over the top of each roll also. FINALLY…. Cover the dish tightly with foil and bake for about 20 minutes. Remove the foil and continue cooking for another 10 minutes. Let stand before serving.